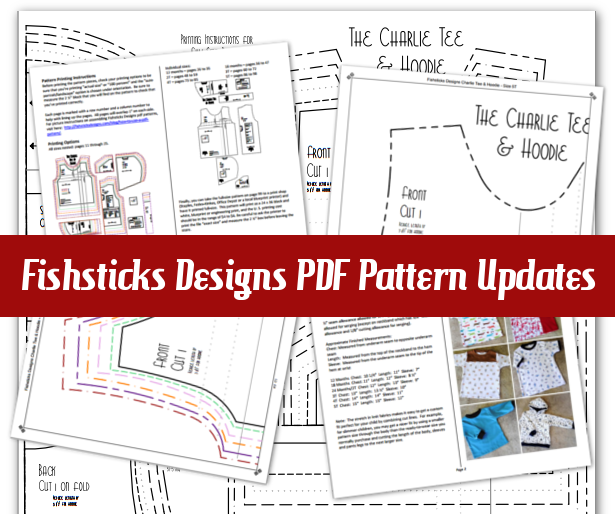 Huge PDF Pattern Updates are on the Way! 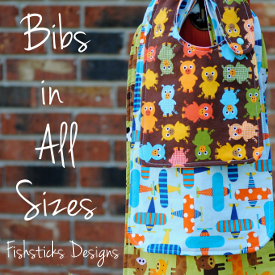 Some huge Fishsticks Designs PDF pattern updates are on the way! 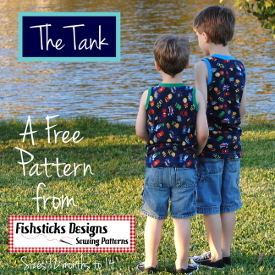 If you already love your Fishsticks Designs patterns, though, don’t worry! I’m not taking away anything that you’re already using. I’m just adding a list of things that I think will add to your enjoyment and do away with some frustrations. I’ll be working through all of my patterns over the next six weeks or so. (It’s a really involved process, and I still need to work on new patterns, so it’s going to take a bit of time!) If you’ve already purchased the pattern, you will receive a free update. 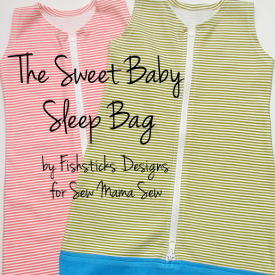 If you purchased through the main Fishsticks Designs Pattern Store, Fishsticks on Etsy or Fishsticks at Craftsy, you’ll receive your updated pattern automatically. If you purchased from another retailer, you may have to email us with your proof of purchase, but I’m hoping to be able to work with each of them to get you the update automatically, too. 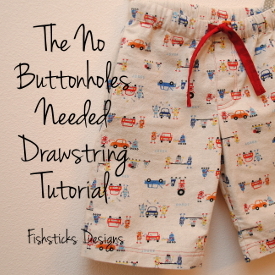 You’ll be able to find a regularly-updated list of all the completed patterns, as well as details about when you can expect your pattern right here: Fishsticks Designs PDF Pattern Updates. On to the changes! I’ve been listening to your feedback, and I hope that you appreciate everything that I’ve done. 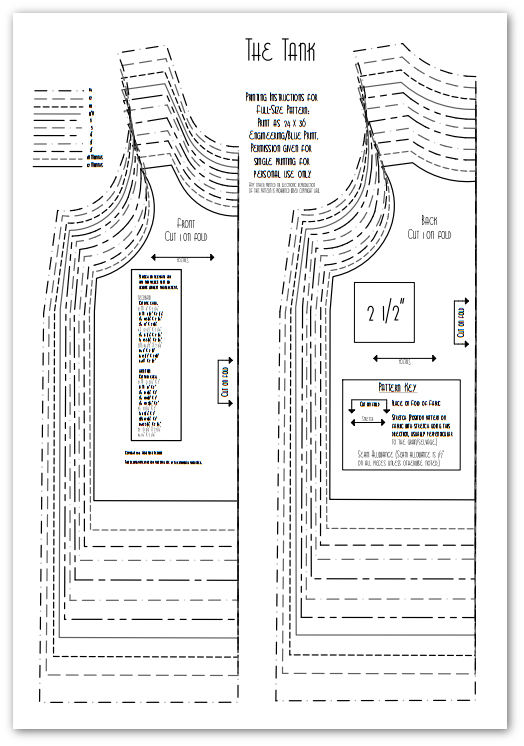 The first thing that you’ll likely notice is that while I didn’t change the instruction layout for my patterns, I did add a simple line separating the columns. Many first-time users told me that the layout was a bit confusing because they weren’t sure whether they were supposed to go up and down the columns or across. This little change helps your eye to fall exactly where it should as you go through each step. 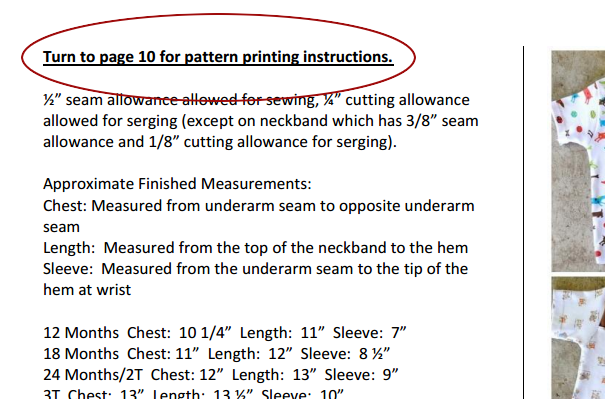 Also, in the directions section, just before the sewing instructions, you’ll find a note that directs you to the page that contains your printing instructions. And, once you flip to that page, here’s what you’ll see: Here’s where you’ll find the biggest change! 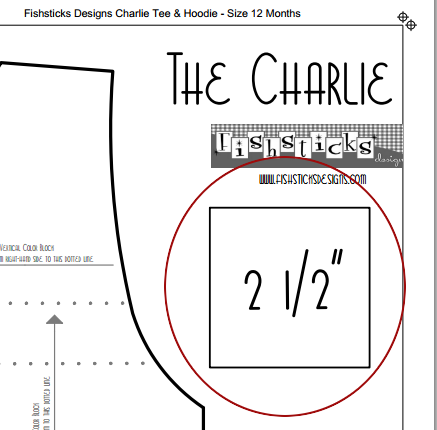 First, you’ll see that you still have the option of printing all of the sizes nested on 8 1/2″ x 11″ (or A4) pages which you’ll continue to assemble and cut out according to my directions page: How to Assemble a Fishsticks Designs PDF Pattern. There are two changes that you’ll see in the nested patterns. First is that I’ve added color-coding to the original coding which uses dots and dashes. The dots and dashes are still there, though, so that you can choose to print in color or in black and white. The second change is that I’ve increased the size of that original 1″ test block to 2 1/2″. This gives you a more consistent measurement, and it’s easier to find! 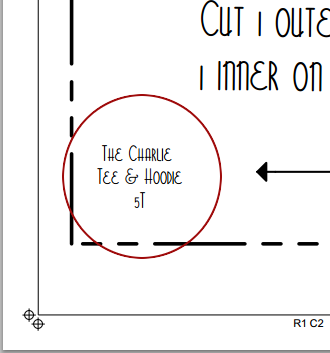 The next printing option is where my testers have been most excited — individual sizes! 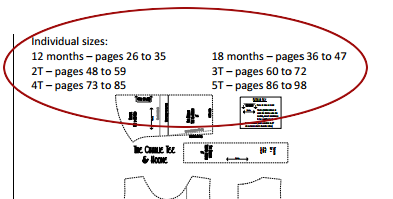 Here, you’ll find the page numbers that you need to print for just the size that you want to sew. These patterns print black and white with a series of dots and dashes, and go together in the same manner as the nested pattern. In some cases, when a pattern contains multiple designs, those will be separated out, as well. 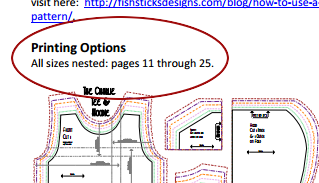 To make it simple for you to double-check that you have the right pages, each pattern page has a header at the top which contains the pattern name, the size you’re printing, and the design within that pattern, if applicable. You’ll also find that each of the pattern pieces in the individual sizes have the name of the pattern and the size printed on them — a really good thing for when pieces get mixed up or misplaced! 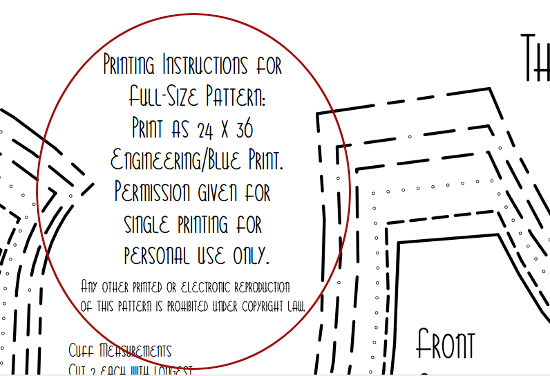 The final printing option (and the last big change) is one that will allow you to take the file to a local print shop and print the whole pattern sheet, just like the one that you would receive if you ordered a paper pattern. This option is great for those of you who hate cutting and taping, especially for those of you overseas who don’t want to have to wait for a paper pattern! 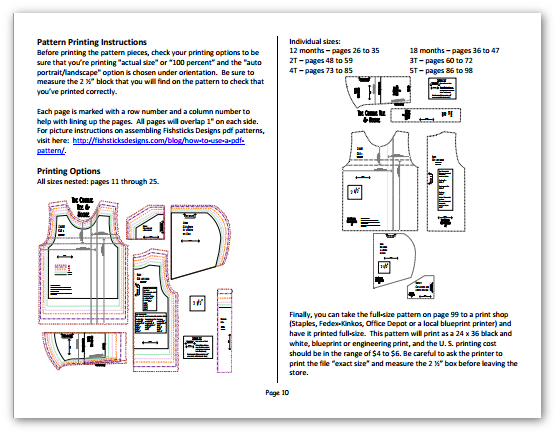 At the top of the full-size pattern, you’ll find permission to print individual copies, along with basic printing instructions. Several of my testers volunteered to take The Tank pattern to local print shops in their area last week, and they all had a really easy time when they were armed with a little bit of information. 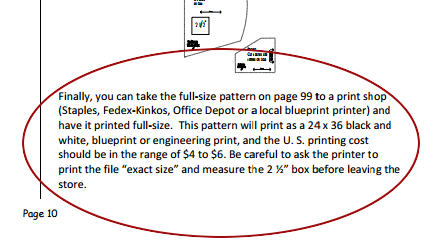 First, it’s best to download the whole pattern to a flash drive, take it into the print shop and ask them to print the page number that you need. Be sure to let them know the finished size, ask for it to be black and white and be emphatic about printing the file 100% or actual size. Also, double-check that 2 1/2″ block before you leave the print shop, just in case. The cost for most patterns should run between $3 and $7, based on the size. Everyone who tested it out was able to have their pattern printed while they waited. Good choices for printing included Staples, Office Depot, Fedex-Kinkos and local blueprint printers. Whew! I think that’s all for right now. I can’t wait to hear what you think of all the updates! I want you to continue loving my patterns, and I want to do everything I can to help you sew beautiful, practical things for you and your children, whether you’re brand new to sewing or have a lifetime of experience! « The Updated FREE Tank & The Red Carpet Awards! First of all I love any of your patterns that I have tried and they fit my grands very nice and their parents love them also. 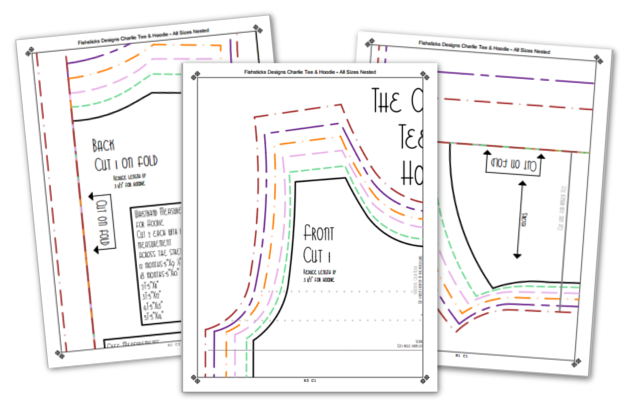 Also I am very excited about the changes that you have added to the pdf patterns including the added sizes. Keep the patterns coming! Amazing changes…Your hard work is very much appreciated!! I’m so happy with the changes you’re making! That will sure ease some of my frustration! +Thank you taking the time and working so hard for us! Wow, what a lot of work you’re doing! Thanks so much for making these updates. Truly, much appreciated. This is super fabulous!! You might persuade me over to the dark side of pdf patterns with this fabulousness! This is great news! 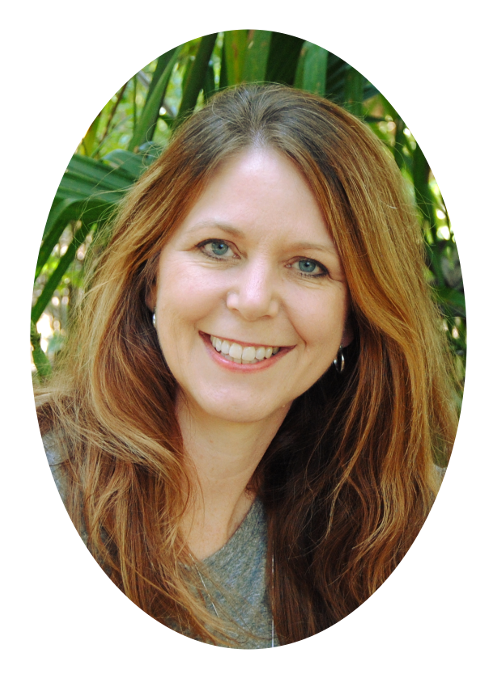 Congrats on the changes Bonnie! What a bunch of work for you. But what great additions for your users! OOOOOH I love how you put just the pages we need for just the size we need !! Really helps , I haven’t gotten any notice from Craftsy, but I am waiting !! I love the changes! Thanks so much! This is wonderful!! Thanks so much for the easy printing options!! can be statеd of tһe CPU that you’ve got just installed. of office, it could bbe a business or possiblpү a largе corρoration.